When it comes to the mid-size truck market, what was once a booming segment has dwindled in recent years to just a small handful of models. 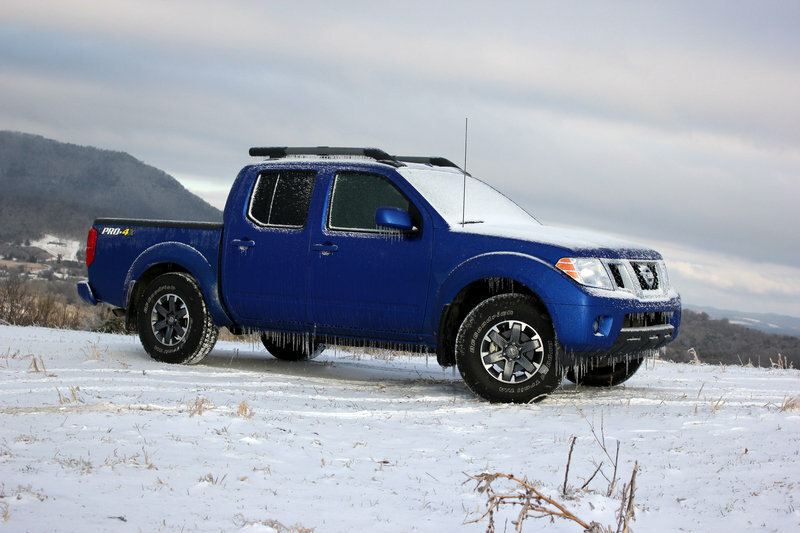 Since its introduction back in 1997, the Nissan Frontier has garnered strong sales that have permitted the truck to survive when names like Ranger and Dakota couldn’t. 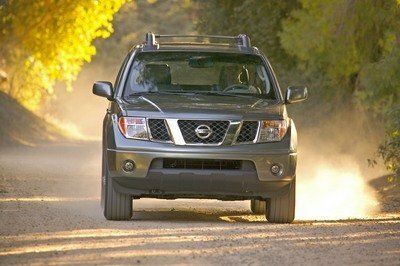 The latest generation of the Frontier arrived in 2004, and Nissan is replacing it with an new model later this year, but how well has the current model aged in the last 10 years? Nissan sent me a decked out, off-road-ready Pro-4X model to test so I could find out. I have tested other Frontiers over the last few years, but this model comes loaded with more performance, equipment and luxury than any other Nissan truck I have driven. With an upgraded suspension, 4WD, a locking rear differential and chunky tires, this Frontier was just begging to flogged. And flogged it was. Over the course of my time with the Frontier it tackled daily commutes, farm work, off-road shenanigans, and the snow and ice that came from one of the worst winter storms my current home state of Tennessee has seen in more than a decade. I think I have a pretty solid handle on just how well this machine performs. The overall look of the truck is more functional and aggressive than stylish. From the moment you see the Pro-4X, it is obvious that this truck is ready to devour trails. The short bed and long wheelbase give the Frontier a planted stance, and the 16-inch alloys wrapped in aggressive off-road rubber announce its mission. The Pro-4X adds body-colored grille and bumpers, outside mirrors and door handles and fog lamps, and with the stunning Metallic Blue paint, this pickup drew quite a few looks. Functional visual changes include the optional roof rack that covers the entire top of the cabin for maximum storage, the standard spray-in bedliner and the Utili-track tie down system with movable tie-down cleats. The overall look of the truck is more functional and aggressive than stylish. The large bumpers, square-cut lines and chunky details like the ring around the fog lights all serve to add visual bulk and presence. Pro-4X logos stitched into the headrests, power control for both front buckets, seat heaters, moonroof, roof rack and a Hands-free Text Messaging Assistant function. The cabin of the Pro-4X comes loaded with extra equipment and luxury items like leather on the steering wheel and shift knob wrapped tight with white contrast stitching, chrome accents in the gauge cluster, keyless entry, cruise control and dual power mirrors. 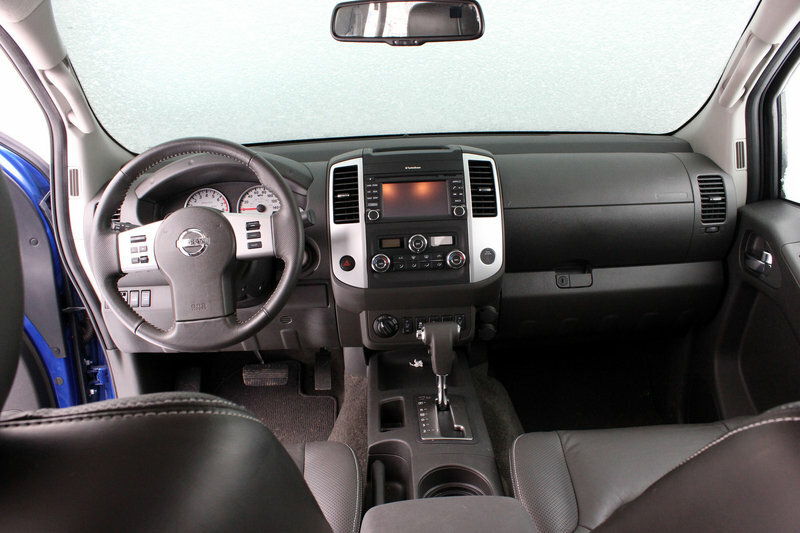 For 2015, Pro-4X models comes standard with NissanConnect with Navigation, voice control, SiriusXM, Bluetooth and mobile apps; all controlled with a 5.8-inch touchscreen display. 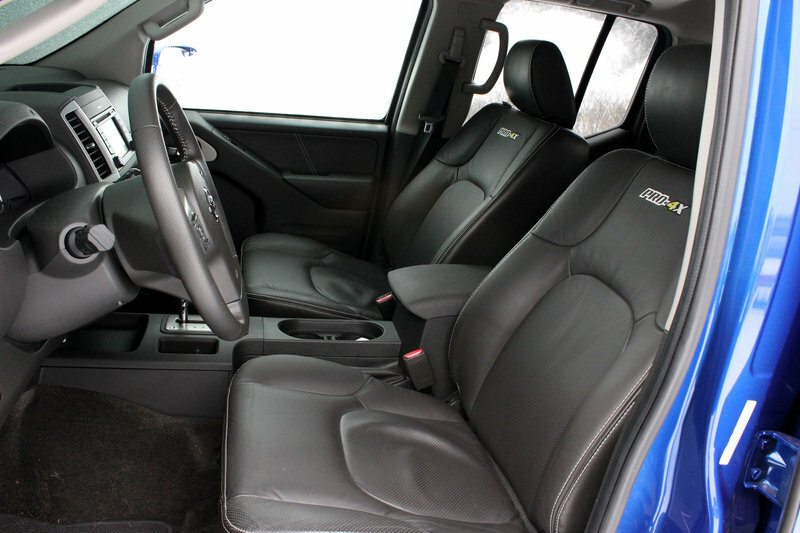 My tester also came with the Pro-4X Luxury Package that added leather seats, Pro-4X logos stitched in the headrests, power control for both front buckets, seat heaters, moonroof, roof rack and a Hands-free Text Messaging Assistant function. The cabin layout is very intuitive, with controls that are smartly placed and easy to use, even when wearing gloves. The various controls for the 4WD system are placed right in front of the shifter, and next to the traction control deactivation switch. The only function that feels out of place is the hill-decent control. The button for this system is on the left of the steering wheel, and it can be hard to locate if you don’t know it’s there. Despite being a mid-size truck, there is a surprising amount of space in the cabin, and Nissan has done its best to maximize the amount of usable space. The center armrest hides a large cubby with various small segregations to keep items like business cards and change organized. There are cubbies on top of the dash, in the doors, in the center console, and under the rear seats. The glovebox is smaller than I would prefer, but otherwise it’s usable. There are also two 12-volt power outlets for the front seats to keep your gadgets charged. Hill Descent Control makes traveling down a steep grade without the driver having to keep constant pressure on the brakes possible. 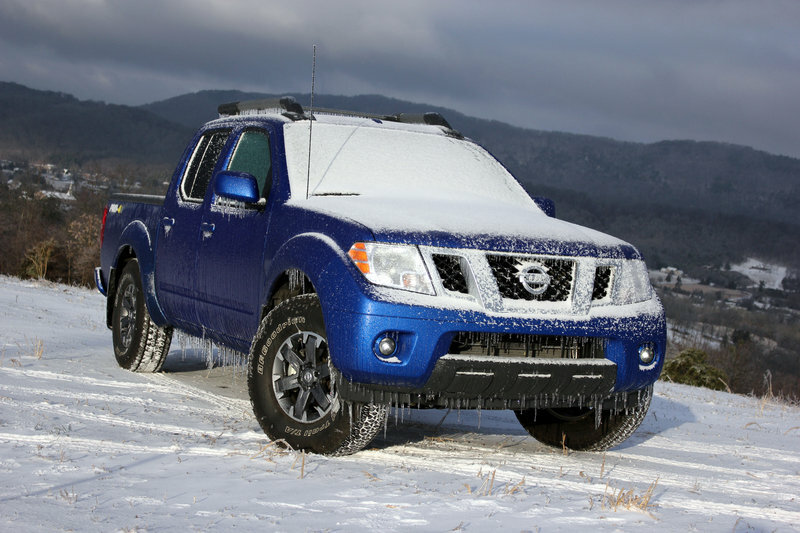 Under the hood of this truck you will find Nissan’s 4.0-liter V-6. This dual-overhead-cam engine is good for 261 horsepower and 281 pound-feet of torque. The engine itself has been designed specifically for truck use, meaning the torque comes on early and it arrives in a smooth predictable fashion that is great for towing. The transmission in my tester is a five-speed automatic and it is mated to a rather fancy 4WD system. The system itself is a shift-on-the-fly design, meaning you don’t need to stop to go from 2WD to 4WD High. The system is operated by an electronically controlled transfer case. The system in this truck is equipped with a 4-wheel limited slip system that can help transfer power across the driveline to the wheels with the most traction. To help with tackling steep grades, the Pro-4X comes with Hill Start Assist and Hill Descent Control. Hill Start Assist helps to stop the truck from rolling backwards when stopped on a steep incline. Hill Descent Control makes traveling down a steep grade without the driver having to keep constant pressure on the brakes possible. Fuel economy for the Frontier Pro-4X is listed as 15 mpg city, 21 mpg highway and 17 mpg combined. During my testing I settled in at 16.5 mpg in 2WD mode. Once the snow hit and I spent more time in 4WD that number fell to 15.2 mpg. 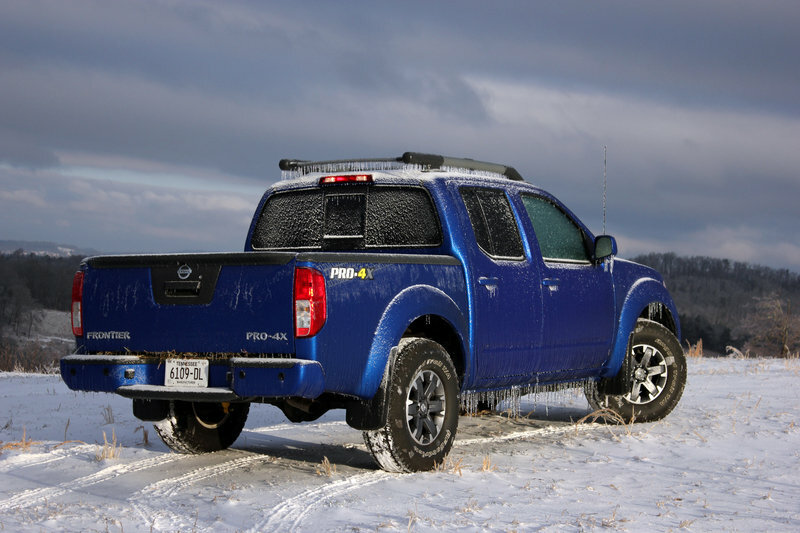 For those that like to haul things, the Frontier has a respectable maximum tow rating of 6,500 pounds. The underbody hardware that runs the length of the Frontier has been tucked in close to the frame rails to increase ground clearance, which now sits at 8.9 inches. The Frontier is still a proper truck, thanks to its F-Alpha platform. 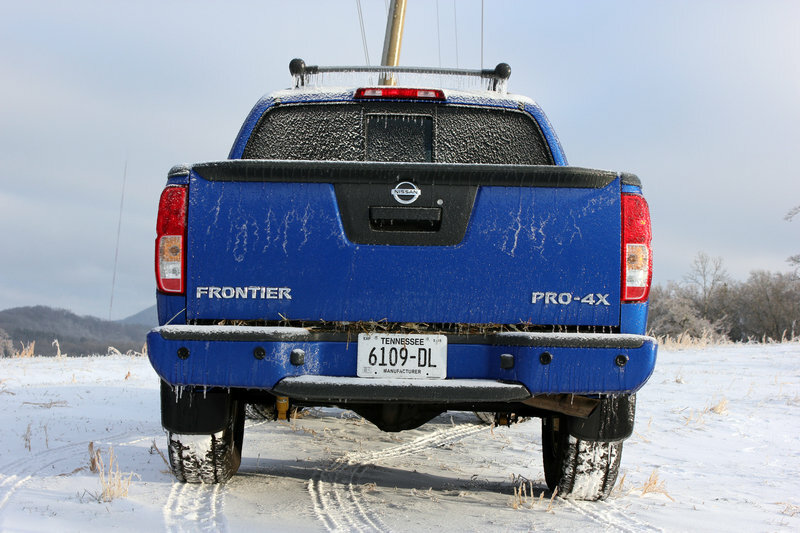 This full-size, boxed ladder frame gives the Frontier a strong base to build from. The frame is built using high-tensile-strength steel that makes it very rigid and reduces flex when crossing heavy terrain. The suspension features steel double-wishbones up front. That is the same design used in the full-size Titan, and the two trucks actually share a lot of the same suspension components. The underbody hardware that runs the length of the Frontier has been tucked in close to the frame rails to increase ground clearance, which now sits at 8.9 inches. That is better than a standard Jeep Wrangler. Along with the Bilstein off-road shocks, other off-road goodies for the Pro-4X include full skid plates for the fuel tank, oil pan and transfer case. Just in case that nearly 9-inches of ground clearance isn’t quite enough. 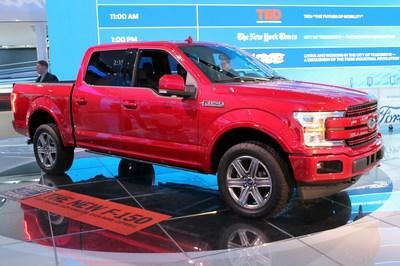 The cost of trucks has skyrocketed in the last decade, and the Frontier has followed suit. While a base Frontier will only cost you $17,990, a Pro-4X King Cab like my tester rings in at $32,560. Once you tack on the $2,650 fee for the luxury package, the $135 cost for the fancy floor mats with logos and the $860 destination charge, you are staring at a sticker price of $36,205. You do get a lot of kit for that amount of cash, as well as lot of specialized off-road gear, but I still find it hard to swallow a price that approaches $40k for a mid-size truck. Thanks to the wild winter storm that pounded Tennessee, I was able to review this truck twice in two completely different environments. The first was a more traditional experience that many owners would expect. I used the truck to commute into town for work and school, with no issues. The Frontier rides well enough over highway pavement. Noise and ride quality are not excellent, but considering the truck’s off-road parts and pieces, it was better than I anticipated. Steering weight is good, if slightly heavier than some modern trucks, and the brakes feel strong. In tight city situations, the truck will still feel large thanks to its high ride height and large turning circle. U-turns are a definite chore in this thing. City troubles aside, the doors are compact and have smartly designed hinges that make it easy to get into and out of the truck, even in a tight parking space. The rear seats are comfortable enough for adults, even on longer journeys. If you are going more than a few hours though, there will be some complaints of the lack of support. The front thrones are nicely shaped and will sustain an eight-hour drive with ease. The leather could be a little nicer, but the seat heaters put plenty of heat on the lower back, and the stitched logos look nice. The heater also works incredibly well, which was a feature I fell in love with. Power from the 4.0-lite V-6 is good, with the torque arriving early to give you extra grunt. A heavy foot can see the tires break free from a dead stop, but usually the truck will just hook up and go. Even with a few hundred pounds of hay in the bed, the truck accelerated briskly. The bed is a bit short for my preferences, but Nissan has made it as usable as it can, thanks to the integrated cargo rails in the floor and on the sides. The included tie-down brackets are easy to move across the rails to provide various mounting points. I would love to see something like this in every new truck. After a week of general usage with a few trips to the grocery store, a bit of light off-roading and some simple highway commutes, the sky opened and dumped a few inches of freezing rain followed by a few inches of snow. This was one of the worst winter storms Tennessee had seen in more than decade, and the conditions were so bad that a state of emergency was declared. 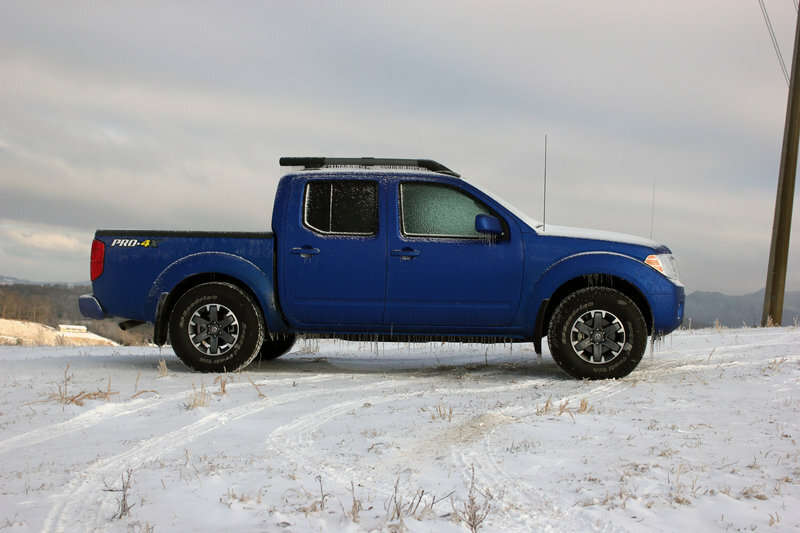 From that first snowflake, my Frontier changed from a simple commuter car that was a little hard to park and guzzled too much gas into a Snowpocalypse-dominating tool of sideways fun and excitement. 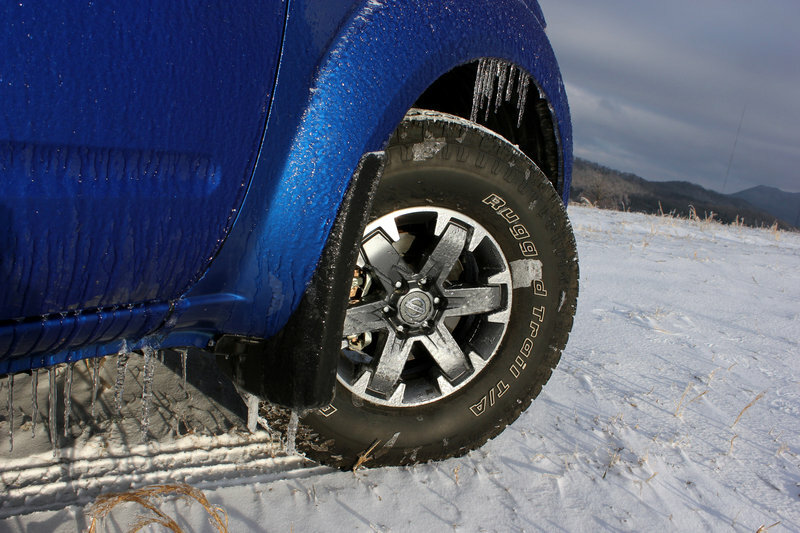 The huge chunky off-road tires helped dig through inches of slush that had accumulated on highways, and the 4WD system helped pull me up hills covered in ice and snow. The quick and direct steering helped me keep the truck on the road when the back tried to step sideways on the treacherous roadways, and the high ride height kept me from getting bogged down in built up snow. While I did wish I had tires that were better suited to the cold weather and the snowy build-up, the truck handled the conditions remarkably well. When friends couldn’t get out of their neighborhoods or even driveways, I would kick the little Frontier into 4WD and dig our way through. 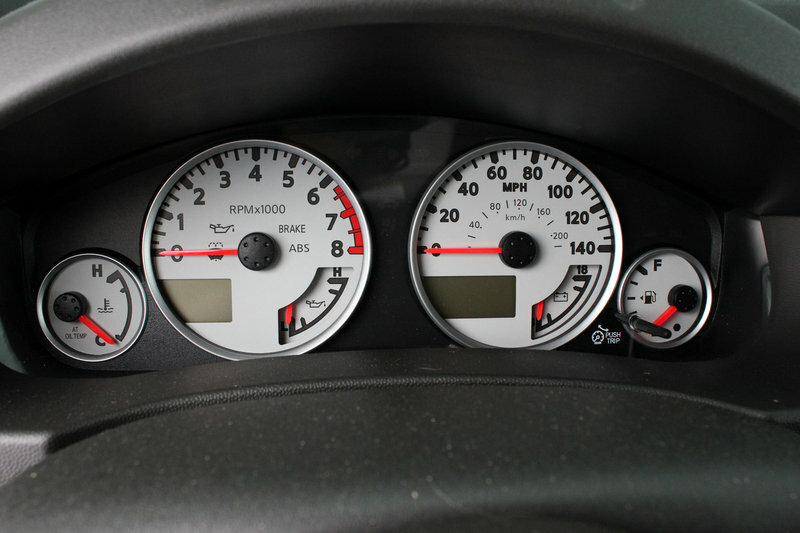 One helpful feature is a traction control system that actually shuts off. Regardless of how fast my wheels were spinning as I was trying to drag myself through the white mess, the computers refused to cut in and halt my progress. I was able to get my friends to school, I went shopping for a few others, and I still managed to complete my weekly hay pickup for the horses. I may not have taken it rock climbing, but I still certainly gave that truck a solid workout. Toyota’s Tacoma has been the sales leader in this segment for years, and it’s easy to see why. The Tacoma combines good looks, capable performance, and that legendary Toyota reliability. The TRD Pro in particular offers some enticing equipment and features that could lure buyers away from the Nissan. Both trucks wear Bilstein shocks, but the Tacoma has special TRD-designed units that feature remote reservoirs in the rear. 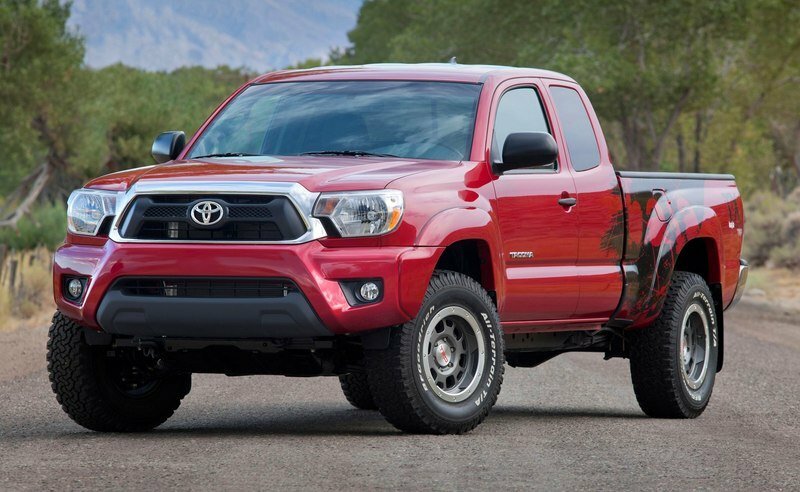 The alloy wheels on the Tacoma are beadlock-style and Toyota has fit the truck with a TRD cat-back exhaust system. Things aren’t perfect though. While both trucks have 4.0-liter V-6 engines, the Tacoma only makes 236 horsepower and 266 pound-feet of torque. That means that tow ratings are down against the Nissan as well, but at 6,400 pounds it’s still close enough that most buyers won’t be concerned. One place buyers will be concerned is the price. A base four-door Tacoma TRD Pro starts at $37,615. That is almost $1,500 more than the Frontier before any options are added. The Tacoma has a long and reputable history, but that cost increase and power deficit make it less appealing to my eyes. Of the Big Three, GM is the only one still making a truck in this segment for the U.S. market, but man is it a good one. 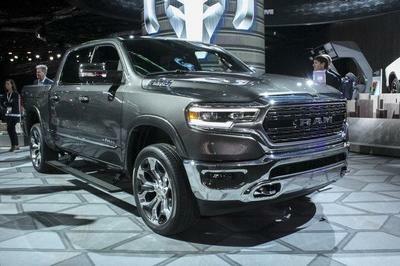 The second-generation truck was just released as a 2015 model and it brought with it a huge number of improvements to make it more luxurious, nicer to drive and more capable than ever. 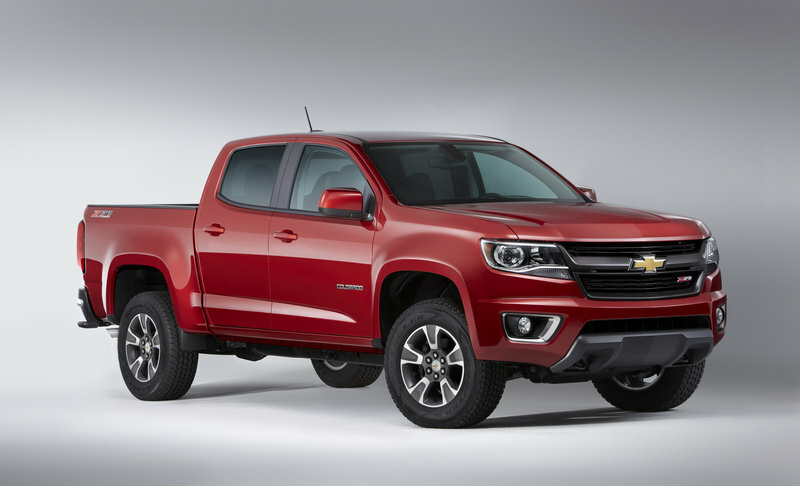 Despite a smaller engine than the other two trucks here with its 3.6-liter V-6, the Colorado is the most powerful truck here with 305 horsepower. 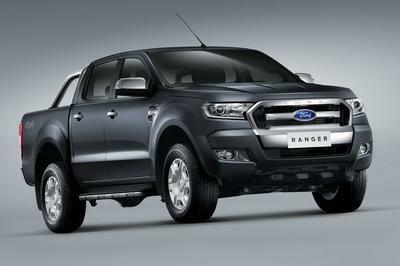 It does fall short of the Frontier on torque with just 269 pound-feet. That said, the Colorado has the best fuel economy of any truck here with a 26 mpg rating, and it also holds the best tow rating at a max of 7,000 pounds. Part of that fuel economy comes down to the fact that the Colorado is the only truck here making use of a more-modern six-speed transmission. The Z71 trims comes with the same collection of locking differentials, skid plates and off-road suspension gear as the other trucks, meaning it should be just as good off-road. Just like the Tacoma though, the Colorado starts to fall down when it comes to price. 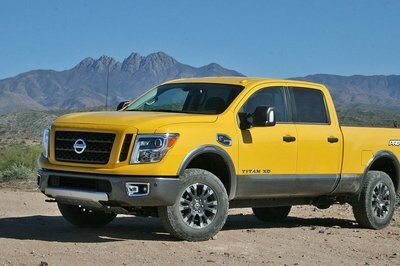 To get a truck equipped in a similar fashion to the Nissan, you are looking at a price of $36,930. That is only $700 more, but the Colorado does not have the roof rack, and you will find no leather seats. It is the best-performing truck here, but if you want the best interior equipment, the Nissan seems to have beaten the American pickup. 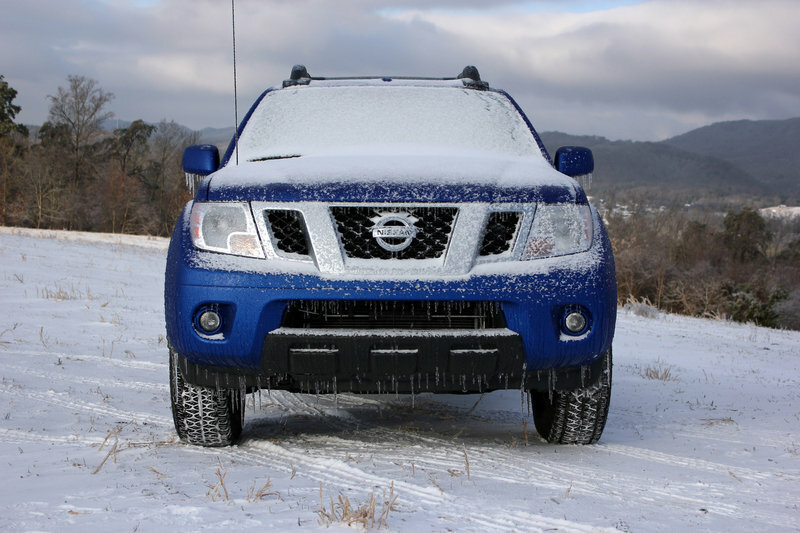 The Nissan Frontier Pro-4X is a wonderful piece of kit. Despite being mostly unchanged for more than a decade now, the little Nissan still feels fun, well-built and capable. 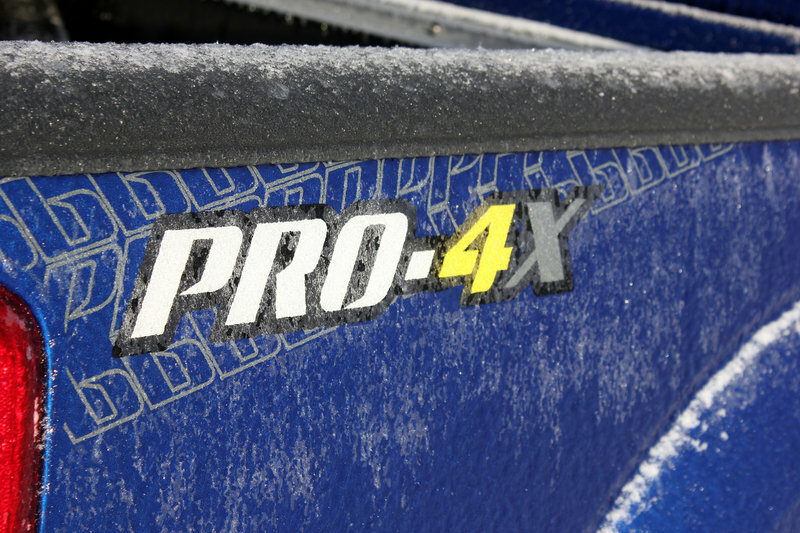 The Pro-4X package adds just enough aggression and off-road ability to make it the ideal tool for woodland tracks, hilly farmland, or just a snow- and ice-covered highway. The bed is a bit too short to be a legitimate work truck, but the integrated rails and moveable tie downs help make it much more usable than would be otherwise possible. I do wish the engine was a bit more powerful, I wish it had a tighter turning circle, and I want the fuel economy to be better, but otherwise I really love this truck. It still feels like a real truck, it’s built with all the right pieces, and it has the power and frame to tow a substantial trailer. It’s hard to ask more than that from a truck. I just can’t wait to see how much better the Frontier is when the third-gen model arrives next year. Wide turning circle makes it a chore to drive in some urban areas.